Register/sign in REGISTRATION IS NOT YET REQUIRED. VISITORS ARE WELCOME. SCHOOLS USING 'REGION' LINK BELOW. Welcome to our forty-second news page here at Schools of Nursing. That it is still here is a real tribute to our members (now over 614) who have kept it alive. My heartfelt thanks.... This particular issue is our first this year - there has been so much to do and seemingly little time in which to accomplish it. We will try to make sure that there are at least three further issues this year. 1. Badge manufacturers and their Maker Marks. 2. Matron Ann Braddick - . Military Nurse/Hospital Matron - QA/Bristol Southmead Hospital/Matron St John's Hospital, Towbridge, Wilts. 3. Sister Mary Jefferys - a PCANSER nurse history. The Nursing badges public gallery - "When our website was first envisaged (we actually opened November 2007) one of our esteemed members, ('eric') suggested that our photograph galleries, then private, could be made public"... our current update is right here. We are currently adding the reverse images of each badge. A vast undertaking which is progressing slowly. You need only point your cursor at a particular badge to see if a reverse has been added. (*Temporarily - You may need to use your browser 'back' button to get back here). Much detail is being added. 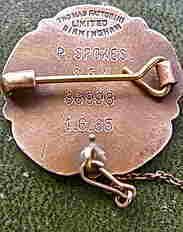 Last time I said 'Individual hospital/school locations have been (and are still being) added; badge shapes; materials used; badge weights; type of fixings; central design (picture) ; inscriptions on the rear (nurse names/dates/maker marks/hallmarks where applicable); designer/s; manufacturers; number made; and dates first awarded are all salient points in our quest being addressed'. Reverse sides being added to each badge wherever we have the photographs. In short, everyone who has agreed to our publishing a public gallery will have one - using their own photographs wherever possible. We must surely have a copy of almost every UK nursing/hospital badge ever produced. Click a badge photograph to see the single page! The links can take you back and forward - a page at a time (24 badges per page) - for all 1250 pages if you like. Or go to the 'Gallery Start" page at the bottom of any individual badge to get back to the numbered 24 badge page. Sound complicated but you will quickly get the hang of it - promise! Email messages - Training Transcripts - Qualified Nurses. But the photographs are not our be all/end all. Our online articles (41) are gaining too, to say nothing of our nursing histories and news pages. There is a great deal of research involved. Someone's time. Someone's money. All given selflessly without thought of gain. What we have here are the seeds of success. But please, don't break copyrights when uploading/sending photographs. If you are ever uncertain please ask. Most copyright holders we have met so far have been only to keen to assist. And if you want to join - welcome to the Forum and Member Galleries -	Register Here. Please be aware, our site is rated on Google by Norton Internet Security as being absolutely safe. We intend to keep it that way. You can help by using a reasonable ID and your own genuine email address. Anything that appears dubious may result in failed registration. Our site is free to users. It is hosted by the largest ISP in Europe at commercial rates - with highly professional back-up. Safe and secure! Worldwide.. Certainly our visitors are wide ranging - from 44 countries worldwide... Australia & New Zealand and Canada are well represented in addition to the UK and USA. There are also some more esoteric sounding countries - China; Russia; Cayman Islands; Japan; Malaysia; plus Romania and Spain. E-Mail Contact - 'contact' link (here and throughout the site) arrives directly on the webmaster's desk. Use it to communicate directly with the site. All mail is considered confidential unless the contents are stated to be otherwise. Stated to be for public consumption by you. Publication itself is an editorial decision. Collecting... 'Battered badges IIl'. Damage repairables - Repaired! First words to 'backman' our moderator. 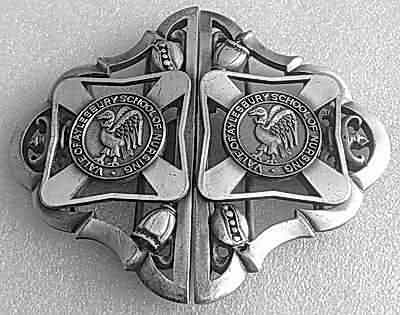 "Nursing badges are' notoriously difficult (to repair) once damage has occurred. Many of our nursing badges have a vitreous enamel finish. This is essentially a form of glass and I have previously accepted damage as just one of these things. After many attempts to find some means of effecting a repair that doesn't look too amateur I have tracked down a specialist firm in Birmingham that does re enamel badges. Gladman & Norman;" (links below). 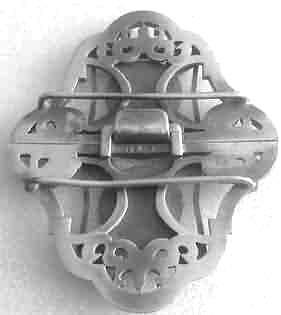 We don't have an original reverse side image, but can safely assume identical detail and fittings as below. And no, the photographs have not been doctored. If anything the actual badges are far and away more beautiful..! So what do you say now? Are they worth as much as the originals? Leaving out all other possible variables (such as previous owner; year of issue; patina; catch condition; other modifications: etc?). My own verdict is yes. Certainly... Do I have reservations? Yes, I do have just one. I have always believed that any badge should be left in it's original condition. Attempted repairs sacrilege! But I am no longer sure. The quality of these 'rebuilds' is nothing short of amazing. Pristine! Perhaps that is the source of my niggling doubt. Pristine it may be, but it is not the original - or is it? My personal jury is out. But I bought one anyway. Gorgeous! 'Backman' says - "I have re-enameled three Nightingale school of Nursing badges......and I have uploaded photos to the album pages of SoN before and after shots for comparison. They will quote for specific repairs but costs are around the £150 to £200 range each!" Have you ever seen a buckle from Vale of Aylesbury School of Nursing before? This is certainly a first for me! It really looks to be an absolutely stunning item. And we have permission to use the photo! What better?.. *Training Hospitals/Details *Not currently Available. *Sincere thanks to SoN member 'backman' for the supply of this photograph. I wonder if any of the nurses can still be identified? 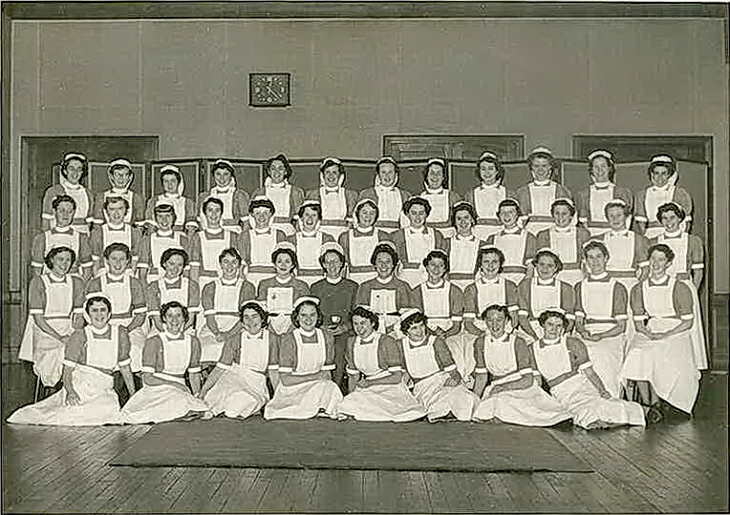 It is not too long ago.. Perhaps a descendant or friend will appear with names - or even one of the nurses in the photograph! Well, that is yet another very pleasant note upon which to end the 42nd Schools of Nursing Site News. Would you like to see your PTS or training group featured here? We desperately need more photographs to feature. Can you help? If so please Contact us. used to produce the News Pages. 8. 'catandfrog' (July) - (ebay). 9. bokojnr (Dec) - (ebay). 10. blue.bottle (Dec) - (ebay). 12. Hotminicooper (Jun) - (ebay). 13. Right-one50 (Oct - (ebay). 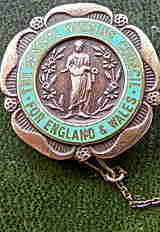 14. jcollinsmedals (Dec - (ebay). 15. 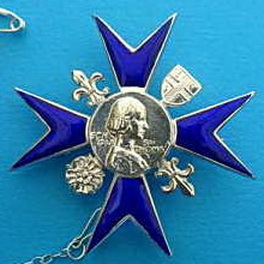 Brittania Medals (Dec 2009). 16. elaine3080 (Feb 2010) - (ebay). 17. Fran Biley (Feb 2010) - schoolsofnursing. 18. St Andrews Children's Hospice - Grimsby. 20. Christmas 1923 - Eric Wilkinson, schoolsofnursing. 38. Sarah Rogers - schoolsofnursing. 42. Margaret Maxwell - (ebay). 45. the collectique - (ebay).